If you have been on Twitter for any length of time, you no doubt have found that getting people from twitter to your checkout page can be a laborious chore to say the least. But, have you ever considered that there may be an approach that can take the anguish out of trying to convert Twitter users into paying customers? 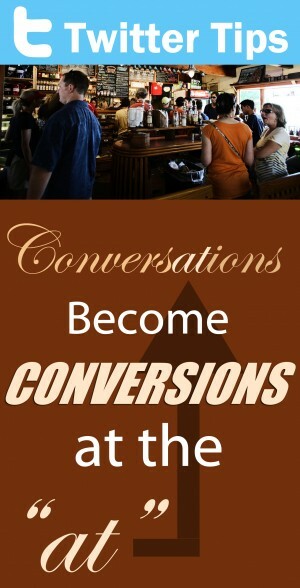 Keep reading to find out how to change the “s” in conversing to a “t” in converting. That’s right, conversing with your users on Twitter is a key to converting them into paying customers. I know, you are thinking, “How do I converse with only 140 characters?” Before we get to that, though I want to clarify what “conversing” is in this context. It means engaging your followers in a conversation of sorts. It doesn’t have to be like texting back and forth or saying something and waiting for a response. Rather, it means sharing about three times as much as you ask for. What do I mean? In this video Rachel (from Google) and Anne (from Twitter) talk about this concept as the 80/20 principle. Go ahead, follow that link and watch about 2 to 3 minutes of the video, and then come back to this post. So, the conversation that we are talking about is achieved by creating tweets that help your followers get to know you. When your followers see the inner workings of your business or sit in on conversations that you or someone in your company has with someone else, they mentally (and eventually emotionally become involved with your brand). They begin to trust that you are someone that knows what they are talking about with regard to your industry. Only after this trust has been cultivated, can you begin “asking” and see results. When you receive a follower, use that as an opportunity to start a conversation with that follower. As Anne mentions in response to a question posed, it should be more than a robotic autoreply. Show your staff working on product or displays (if you have a brick and morter store). If you provide a service, share your knowledge about the service so your followers can see proof of your expertise. Ocassionally ask a question that your followers may want to respond to via a reply tweet. This feedback can be very beneficial to you and reveal what your followers care about. It’s no wonder that converting followers into customers requires this “conversation”. The etymology of the word conversation actually carries the thought of “having dealings with others”. So it really is fitting that it be the avenue to building trust. Marketing, Social Media, Strategic Marketing, Twitter Engagement, Increase, Listening, Trust. permalink.